How Does Maryland Law Address Prenuptial Agreements? A prenuptial agreement is a contract that future spouses execute before they get married. Most prenuptial agreements protect one spouse’s assets and property from the other spouse. If the spouses ever get divorced, a valid prenuptial agreement overrides the usual rules concerning property division. In certain cases, prenuptial agreements can dictate the future terms of alimony and other support payments. The Maryland Family Law Code does not have a law or statute that governs prenuptial agreements. Instead, Maryland interprets prenuptial agreements according to contract law. In other words, the courts look at these agreements in the same way as any other contract. In most cases, this means that both spouses are bound to the terms of a validly executed prenuptial agreement. In exceptional cases, however, there are several ways to get out of a contract in Maryland. 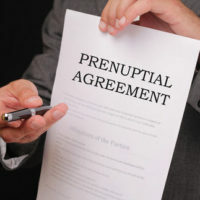 For a prenuptial agreement to be valid, the two parties must be competent to enter into a legal contract and must knowingly and willfully enter into the agreement. If each party has his/her own legal counsel, there is a higher level of assurance that each party understood the terms of the agreement and entered into it knowingly. Neither spouse can exercise undue pressure or coercion. For example, if the wedding is days away and the guests are arriving and all of the wedding payments are non-refundable, it would be considered coercion if one spouse presented the other spouse with a prenuptial agreement and demanded signature in order for the wedding to proceed. The parties cannot misrepresent their respective financial circumstances to one another nor engage in any fraud in the preparation or negotiation of the agreement. Normally, the parties provide “disclosure” of their assets, liabilities and income to each other as a written attachment to the agreement. Whether either party will be entitled to any spousal support in the marriage terminates and how much support will be paid and for how long. Likewise, the parties can waive any future claim to spousal support or alimony. Child custody and visitation in the event of the termination of the marriage. The best interests of any current or future children of the parties will have to be determined at the time of the termination of the marriage based on the circumstances that exist at that time. Child support in the event of the termination of the marriage. The court has a set of rules for determining support of children, and the parties must adhere to those rules and calculations. The parties do not have the ability to waive support for their children. Waiver of or rights to retirement assets. These terms may be contained in the prenuptial agreement, but those terms need to be reaffirmed or ratified after the parties are actually married. Upon the termination of the marriage, if the court upholds the prenuptial agreement, then all of the terms and conditions contained in the prenuptial agreement are incorporated into the final Judgement granting the parties a divorce. If the court does not uphold the prenuptial agreement, then the parties will need to proceed with litigation and/or settlement negotiations in order to resolve all of those issues. If you have legal questions about prenuptial agreements in Maryland, it can be distinctly valuable to speak with a skilled family law attorney. The attorneys at Schlaich & Thompson, Chartered in Bel Air, Maryland, have more than 55 years of combined legal experience in matters of criminal defense and family law, including prenuptial agreements. If you need legal help, contact us for an initial consultation.